Fighters from the ISIS terrorist group are “living their final moments” in the last enclave they hold near the Iraqi border, as the U.S.-backed Syria Democratic Forces (SDF) has engaged those fighters, a spokesman for the SDF says. Mustafa Bali, who is in charge of the SDF media office, said Jan. 13 its forces had ramped up attacks in the last two days and taken control of the area between the ISIS enclave and the Iraqi border, cutting off an escape route. In December, President Donald Trump announced the withdrawal of 2,000 U.S. troops from Syria, citing the defeat of ISIS and how U.S. forces were no longer needed there. A Department of Defense spokesman confirmed Jan. 11 that the coalition has started the withdrawal process. “We will be leaving at a proper pace while at the same time continuing to fight ISIS and doing all else that is prudent and necessary!” Trump said in a Twitter post on Jan. 7. A victory over the terrorists in the enclave would essentially take down the group’s territorial foothold on the eastern bank of the Euphrates River. 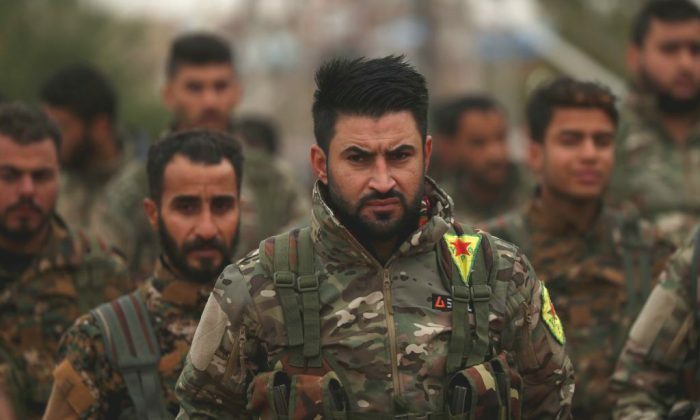 With the help of the U.S.-led coalition, the SDF—a group of militias led by the Kurdish YPG—has driven ISIS out of northern and eastern Syria over the past four years. A November report from the Department of Defense found ISIS has lost all territories it once held in Iraq and controls only 1 percent of the territory it once had in Syria. U.S. armed forces recently killed Jamal al-Badawi, who led a deadly terrorist attack on the USS Cole in the year 2000. Trump announced the news in a Twitter post dated Jan. 6, two days after the U.S. military said it had carried out a strike targeting al-Badawi in Yemen. Three senior Pentagon officials have resigned following Trump’s decision to pull out from Syria. Rear Adm. Kevin Sweeney, the chief of staff to the secretary of defense, resigned Jan. 6 after holding the position for two years. “I’ve decided the time is right to return to the private sector,” Sweeney said in a short statement. Pentagon spokeswoman Dana White also stepped down from her position. White’s resignation at the end of December came amid an internal department investigation into her conduct, after a number of complaints from other staff were filed against her. Sweeney’s resignation comes just five days after Jim Mattis left his post as defense secretary on Jan. 1—two months earlier than the previously planned departure in Feb.